Abhayakaragupta (Tib. 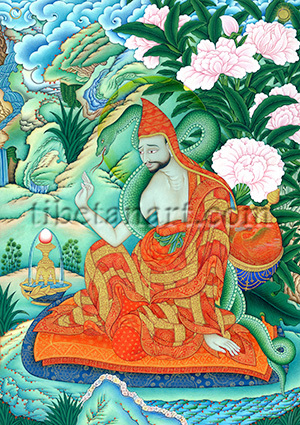 Jigme Jungne Bepa) was born in Eastern India in the mid 11th century and died in 1125. He lived during the reign of King Ramapala (c. 1075-1120), and was highly revered as as one of the last great Buddhist masters of the Pala Dynasty, who flourished prior to the Islamic invasion with its resulting destruction of Buddhism in India. Under the auspices of King Ramapala he was appointed chief abbot, first at Bodhgaya monastery, then later at Vikramashila and Odantapuri. This painting of Abhayakaragupta is drawn from a series of thirteen late 17th century thangkas, that were then carved into a series of thirteen woodblock prints in the 18th century at Narthang Monastery near Shigatse in Tibet. The first ten of these images depict the ten previous incarnations of the Panchen Lama, with Abhyakaragupta being the fourth incarnation, and the 1st Panchen Lama, Lobsang Chokyi Gyaltsen (1570-1662) appearing as the eleventh in this series. The large snake coiled over Abhayakara’s shoulder refers to an episode where he magically manifested as a giant serpent in order to subdue one of India’s evil Candala kings who practised human sacrifice. The phoenix-design basket behind Abhayakara’s back contains the Tripitaka or ‘three baskets’ of the Buddha’s teachings on Vinaya (discipline), Sutra (discourses) and Abhidharma (metaphyics). The precious jewel offering to his left pours forth an endless stream of nectar; in a similar manner he was said to have miraculous fed the starving inhabitants of Sukhavati city from his alms-bowl, and to have revived a dead child in a charnel ground. His transparent yellow halo that appears in this image is painted with genuine ‘Indian Yellow’ pigment, which was made from the urine of cows fed only on mango leaves. This restricted diet caused the secows be undernourished and short-lived, and its production or sale in India has been banned since 1908 on inhumane grounds.